Each week, the PFF analysis team will bring you break downs of the most important matchups for each game of the NFL season. 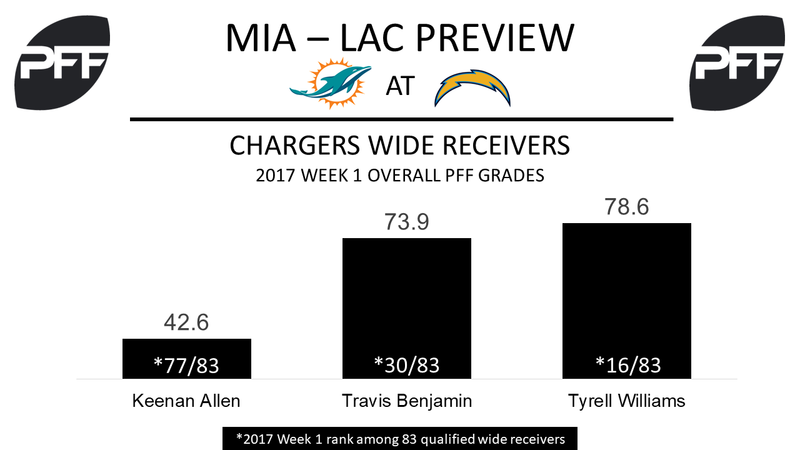 WR DeVante Parker vs. CB Trevor Williams – While a lot of eyes will be on Jarvis Landry and Casey Hayward, this battle right here will be key as well. Parker had a solid season last year, finishing 39th out of 96 qualified receivers in yards per route run at 1.72. But he will be looking to explode this year with a lot of attention on Landry. He will be facing off a lot with Trevor Williams, who is replacing Jason Verrett, who is out with a knee injury. Williams struggled last season, ranking 97th out of 118 qualified cornerbacks in passer rating when targeted at 109.6, and raking tied for 94th in yards per coverage snap at 1.49. 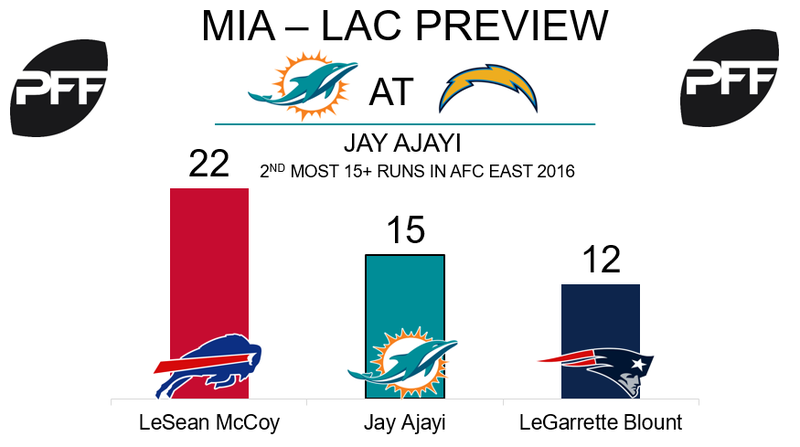 RB Jay Ajayi vs. DI Brandon Mebane – Jay Ajayi was a monster in 2016, as his overall grade of 87.5 was fourth among running backs. Ajayi is very good at ripping off big chunks of yards on the ground, as he had 15 runs of 15+ yards last season, which ranked seventh out of 52 running backs. Among those looking to stop him will be interior defender Brandon Mebane. Mebane has had a long, solid and very consistent career. His overall grade has never dipped below 72.9 (his rookie season) and last season’s grade of 83.3 was the second highest of his career behind his 2013 season where he graded out at 85.9. LT Laremy Tunsil vs. EDGE Joey Bosa – Laremy Tunsil was a guard last season, finishing with a solid overall grade of 70.7, ranking tied for 34th out of 76 qualified offensive guards in pass-blocking efficiency at 96.3. However he didn’t give up a single sack, which included him with some of the top pass blockers in the game. The switch to left tackle will be a tough one, and his first matchup won’t be very easy. Last season Joey Bosa had the fourth highest pass-rush productivity rating among 57 qualified 3-4 OLBs at 13.8. He will likely see some of Tunsil and some of Ja’Wuan James, as in Week 1 he rushed 16 times from the right side, and 16 from the left. WR Travis Benjamin vs. CBs Xavien Howard and Bobby McCain – Travis Benjamin’s 2016 season graded out to a slightly above-average 69.6 overall, and he’s started 2017 off well, pacing the team’s wide receivers with two deep targets, and catching the only catchable one for a 38-yard touchdown in Week 1, earning a 73.9 overall grade. Benjamin lines up all over the formation, and with Byron Maxwell primarily covering the right wide receiver, he should frequently line up in opposite Xavien Howard and Bobby McCain. Howard graded out poorly in his 2016 rookie-year at 48.7 overall, allowing a reception for every 9.7 coverage snaps, 65th of 112 eligible cornerbacks. McCain primarily mans the slot, and allowed 158 yards after the catch along with four touchdowns last year. T Joe Barksdale vs. EDGE Cameron Wake – Joe Barksdale performed well below-average at right tackle in 2016, grading out at 56.2 overall. It was his 43.7 run-blocking grade that most negatively affected that overall mark; however, his 71.5 pass-blocking grade was above average. He’ll hope to perform closer to his 2016 levels after earning a 31.4 pass-blocking grade last week, especially with Cameron Wake lining up across from him for Miami. Wake earned an 86.9 overall grade last season, ninth highest among eligible edge defenders, and his 88.6 pass-rushing grade was the fourth highest. Wake’s 14.1 pass-rushing productivity grade was tied for the highest among all eligible 4-3 defensive ends. RB Melvin Gordon vs. LB Kiko Alonso – Melvin Gordon had a breakout 2016 season, with the seventh ranked elusive rating among qualified running backs last year with a mark of 37.4. Kiko Alonso will be the linebacker most often tasked with slowing him down. Alonso’s 6.6 run stop percentage in 2016 was 48th among 60 eligible inside linebackers, and his 7 missed tackles were tied for the 14th out of the same group. His 9.9 tackle efficiency against the run – the number of total tackles per missed tackle – was 42nd out of 64 eligible inside linebackers.